The bathroom at the classic punk club CBGB serves as inspiration for a new exhibit opening tonight at the Wadsworth. PLAY BALL! : We've got a pair of diamond-themed events to get your juices flowing for America's Pasttime. First, we take you to New Britain, where the Rock Cats are hosting the Altoona Curve. But it's not just the game that should draw you to the stadium. And it's also not just the Twisted Tea Happy Hour up in the Sam Adams Party Deck. It's the pre-game, all-you-can-eat buffet. Organized Parents Make A Difference (OPMAD), a Hartford-based nonprofit dedicated to after-school programs for students, is hosting a "Family Fun Night." tonight. For $15, you can enjoy all your summertime food faves, including hot dogs, hamburgers, chips, watermelon and beverages. The buffet runs from 5:35.p.m.-7:05.p.m. Game time is 6:35 p.m.
OR, you can make your way to Torrington, where the Titans of the Atlantic Collegiate Baseball League have opening day of their inaugural season. The Titans will take the field at Fuessenich Park against the North Jersey Eagles. And before you head to the park for the 7 p.m. game, you can mosey on over to the Cambridge House Brew Pub. The Cambridge House teamed up with the Titans for a special blonde ale just in time for summer. Tickets for game one of 41 is $5. BLUES AND BREWS: Bushnell Park in Hartford will be alive with the sound of music tonight (sorry for the unfortunate reference to Julie Andrews). It's time once again, for the annual Hartford Advocate Black-eyed & Blues presented by Red Hook Longhammer IPA and Bud Light. For the 11th year, rock out to some great music while digging in to some sizzling food and ice cold beer. From 5 p.m.-11 p.m. fans will be able to listen to the music of artists like Ryan Hartt & the Blue Hearts, River City Slim & the Zydeco Hogs, Larry Garner Blues Band, Sarah Borges & the Broken Singles and Jeff Pitchell & Texas Flood. BBQ is provided by Black-eyed Sally's. The event is free, and rain or shine. FOR A GOOD TIME...: Art inspired in a bathroom is too often limited to dirty jokes, suggestive illustrations and the occasional limerick. But one man's urinal doodle, is another man's inspiration for high art. Justin Lowe, an artist known for transforming white-cube interiors into cluttered labrynths, is recreating the classic, graffiti-covered restroom at the famed CBGB punk rock club in New York City at the Wadsworth in Hartford. Lowe's multi-room, multi-media art experience opens at the museum tonight. 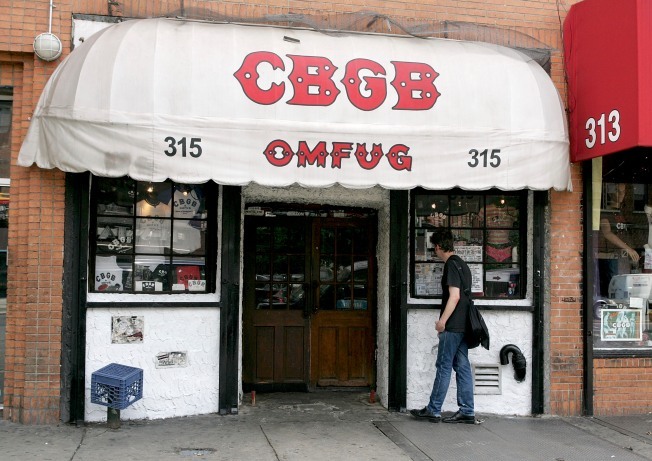 The installation is less a copy of CBGB's bathroom, but rather an homage to the club that spawned the careers of acts like the Ramones and Blondie. Lowe's "Werewolf Karaoke / MATRIX 159" will be on display through Sept. 5.